Protect your people, protect your floors and protect your doors, with the trusted Agrippa magnetic door holder. According to Atomik Research, over one third of people admit that they have seen a fire door propped open in their building. The effects of wedging open a fire door can be devastating, as this allows toxic smoke and flames to spread through the building very quickly, in the event of a fire. 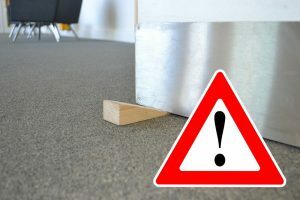 Further research by Atomik found that one fifth of people noticed that there are damaged doors in their building, such as holes, cracks and chips. This can further prevent the fire door from protecting the building, and be costly. British manufacturer Geofire has solved both problems with the trusted Agrippa magnetic door holder. The device is fitted to the wall to hold the fire door open using a magnet, avoiding damage to both the fire door and the floor. Agrippa differs from traditional fire door retainers because of its wire-free installation, as the device is battery powered. Geofire is the UK’s leading manufacturer of hard wired fire door magnets, Nick Goddard Research and Development Manager, said: “The Agrippa fire door holder isn’t like any other sound activated device on the market. It can be installed at any height however, for a door with a conventional overhead door closer, we recommend installing the holder at the top of the door to avoid costly damage to the door and floor, as well as for hygiene reasons in a hospital environment. Packed with features, the Agrippa magnetic door holder has a daily timed release option, to ensure all doors are closed at the end of the day; a battery level indicator, to allow the responsible person to check the status of the holder; and a low battery, fail-safe power cut, to ensure doors are not held open when the unit is out of battery. Wedging open fire doors could lead to legal action under the Regulatory Reform Fire Safety Act 2006 and Health And Safety at Work Act 1974. The Agrippa magnetic door holder is recognised by UK Fire and Rescue Services and the London Fire Brigade, and CE marked to EN1155. Agrippa is a trusted solution to safely and legally hold open fire doors.